As I was writing this, a leaflet came through my door from the ‘Forward Together‘ group. The leaflet warned about the ‘nationalists’ and ‘separatists’ who are trying to ‘break up the union’. It was clearly aimed at those who voted ‘No’ in the #Indyref. However, what the leaflet failed to mention is that it too was supporting a nationalist movement. Let me say it clearly, British nationalism is no less a form of nationalism than Scottish nationalism. It is British nationalism that seeks to maintain a political union between Scotland and England (a united nation-state, that also includes Wales and Northern Ireland). Such British nationalism can in some cases be inclusive of other nationalisms. Thus, for example, there are many Scots who consider their nationality to be Scottish but are also pro-union and pro-British (such as Gordon Brown, as he made clear in his eve-of-referendum speech on 16 September 2014. And there are plenty of English nationalists who are also pro-union, perhaps represented most clearly by David Cameron with his ‘English votes for English laws’ unionism. But Clegg and Miliband are likewise English nationalists within the context of the British nation. Such a nationalism often conflates Englishness and Britishness, as though they are interchangeable identities (give or take a few quarrelsome Scots and others). This is part of the problem. It is no accident that the name of the party that most obviously claims this ground is the UK Independence Party. For most mainland (British) people the terms UK and British are also largely interchangeable. That is, in effect, Ukip is the ‘British nationalist party’ (in comparison, for example, with the Scottish Nationalist Party). Ukip has avoided that name for obvious reasons, since after all the BNP already exists. Ukip stands largely in an area that has previously been claimed by a large body of Thatcher’s English supporters, and also most likely supporters of the early Blair. This is, very clearly, an important political constituency for any party that wishes to hold office in Westminster. The political interests of this constituency of middle England (outside of London) are right of centre. This is in marked contrast to the nationalism of the SNP, which appears to have replaced Labour in Scotland as the left of centre party. It is for this reason that the likely success of Ukip in the coming election is unpredictable, since they may well benefit from the English fears of Scottish nationalism (and the subsequent ‘threat’ to British nationalism) that have been so prolific in this campaign. In drawing attention to British nationalism, my aim is not to criticise such nationalism. Personally I would like to see Scottish independence, and I view Britishness in terms that are regional rather than nationalistic. I do not see the advantages of a united British nation – particularly as so many British people (around half of Scots) are unhappy with the union. But British nationalism is here to stay, for a while. Whether it is expressed in Tory, Labour, LibDem or Ukip terms, there are many people in the UK who are fervent British nationalists. Most of these people are English, mainly because the English make up the large majority of UK citizens, and because much of Britishness is linked to English national identity. And although the term British nationalism usually indicates far-right tendencies, such nationalism (like Scottish nationalism) can in fact be either left or right of centre, and it can be exclusive or inclusive. British nationalism is not solely right wing anti-immigration and anti-multiculturalism. As James Bloodworth noted about the #Indyref debates, such an image of an inclusive British nationalism was somehow lost during the #Indyref in the clamour of unionist politicians (of all parties) seeking to convince Scots to remain part of the nation. And as Jessica Elgot highlighted, Scottish nationalism portrays itself deliberately and explicitly in terms of inclusion and diversity. For as long as Ukip claim the main mantle of British nationalism there is the fear that such nationalism will be expressed and understood as exclusive and potentially racist. Despite their protests in this respect, Ukip have largely encouraged the idea that they stand for a xenophobic British nationalism. Regardless of where we stand in terms of British nationalism, separation, and independence, we all have an interest in the British Isles remaining a peaceful, tolerant, and progressive place that can live at ease with its diversity. In that respect, a British nationalism that engages with its own differences needs to be recognised and defined by all parties that have a stake within it. In the mean time, British nationalism is a love that dares not speak its own name. 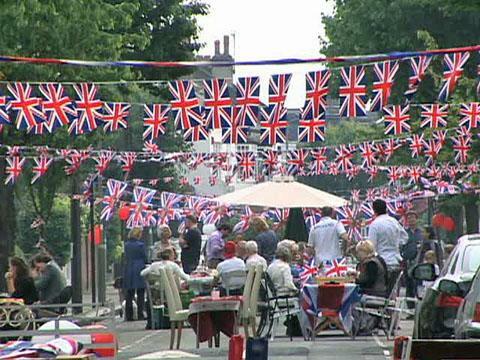 (Photo credit: “Royal wedding street parties main 480 29april2011” by VOA. Licensed under Public Domain via Wikimedia Commons.